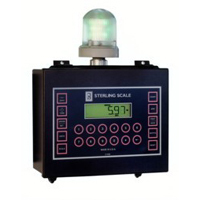 The Quikway Indicator can be installed on any size or capacity scale to check part tolerances or shipping weights.Â It is easyÂ Â to set up, acceptable under weight tolerance and the acceptable over weight tolerance.Â A bright beacon lamp will indicate the status of the weight placed on the scale. Amber = Under, Green = Good, Red = Over.Â The Quikway can be supplied in an optional Nema 4 stainless steel wash down enclosure for wet areas.Â Weight can be displayed in pounds, kilograms or grams.Â The Quikway can check weight or count.Â The response time is typically less than one second. Wall Mount Enclosure Nema 12, wall mount mild steel 10" W x 8" H x 4" D Ship Wt. -Â 20 Lbs. Stainless Steel Enclosure Nema 4, stainless st. wall mount 14" W x 9" H x 6" D Ship Wt. -Â 25 Lbs.